A human powered search engine on SMS, that is positioned as a Q&A service. That’s Ask Birbal! Text your query to +91-9650607080. It needs no special codes or key words. You text your question as if you were asking a friend. You receive an acknowledgment SMS immediately. Followed by the answer in a few minutes. 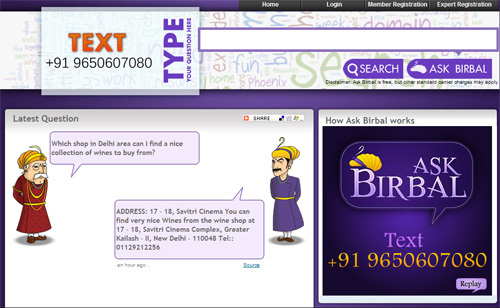 Note: Although Ask Birbal is a free service, your phone carrier may charge for the text messages you send.